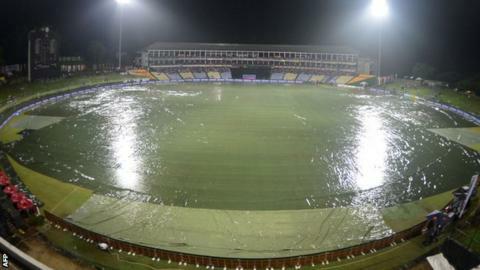 England's fifth one-day international against Sri Lanka was disrupted by rain and will resume on Thursday. Chris Woakes took 6-47, the third best figures by an England bowler in ODIs, as Sri Lanka were bowled out for 239 before the weather intervened. Kumar Sangakkara made 91 for the hosts, his fourth successive half-century. If there is no rain on Thursday, England, 3-1 down in the seven-match series, will begin their chase of 240 from the full 50 overs at 09:00 GMT. If they are to keep the series alive, they will have to reach a total that is at least competitive on a Pallekele pitch that has turned throughout and will be used by the home side's four spinners. To achieve their target, the tourists would be best served to follow the example of Sangakkara, who favoured patient accumulation mixed with lofts over extra cover, clips through mid-wicket and punishment of width. Whilst he was compiling a 95-run stand with captain Angelo Mathews - a partnership that took the hosts from 59-3 - it looked as though Sri Lanka may bat England out of the game. But, after Mathews top-edged Chris Jordan to fine leg, Woakes had Sangakkara pull to the hands of Joe Root on the leg-side boundary and then ran through the lower order. Taking advantage of the Sri Lanka bid for late acceleration, the Warwickshire paceman mixed yorkers and aggressive short deliveries to become the first England bowler to register a second six-wicket haul in ODIs. But Woakes bowled five wides - England sent down 13 in total - and the pick of the attack was off-spinner James Tredwell, recalled in place of Ben Stokes after being omitted for the previous two matches. Not afraid to give the ball air, Tredwell exercised control of line and length for figures of 1-33, with his two maidens as many as the rest of the England bowlers have managed in the rest of the series combined. With Moeen Ali and Root also sharing 15 overs, England adapted to the conditions by delivering 25 overs of off-spin. However, Alastair Cook, back after a ban at the expense of Alex Hales to reclaim the captaincy from Eoin Morgan, deemed the medium pace of Ravi Bopara surplus to requirements. Though that eye-raising decision was perhaps vindicated by the restriction of Sri Lanka to a manageable total, the wisdom of allowing the home side's quartet of spinners to bowl second on an increasingly dusting pitch will be judged on Thursday.